In large bowl, mix tomatoes, paprika, salt and garlic. Add chicken, bell peppers and onion; mix well. Divide evenly between two labeled 1-gallon freezer bags. Lay flat, and freeze up to 3 months. Thaw 12 to 24 hours in refrigerator, until completely thawed. Pour contents of bags into 4 1/2-quart slow cooker. Cover and cook on Low heat setting 4 to 5 hours. Divide rice among 8 bowls. 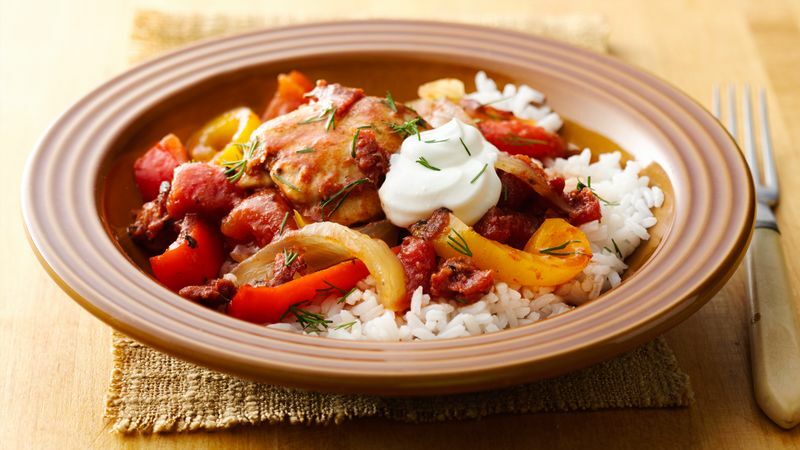 Divide chicken mixture among bowls of rice. Top each bowl with 1 tablespoon sour cream and 3/4 teaspoon dill. Like it hot? Substitute a teaspoon of hot Hungarian paprika for some of the smoked paprika. While a rice cooker makes quick work of a starchy side for this dish, you can skip a step by using frozen cooked rice.